I created a new object directly on my Sandbox. Now I want to pull that object into my project. I right click on the Object folder and click Pull from Salesforce however the new object I created is not one of my choices. The list which you can see at the first stage of the pull process is the list of existing files in your TWS project. Here you can select which of them you want to check for updates on your Salesforce Organization. This is why your newly created files on an Org are absent here. To get a new object from your Sandbox, please open the 'Project metadata components' wizard ( it is available in the menu Project) and make sure that you use the 'Subscribe' option for the Object metadata type. Then please pull from Salesforce. After the existing in your TWS project files will be checked for updates, you will see the files which were deleted or created on your Sandbox and you can select which of them should be removed/added to your project in the IDE. In other words, please proceed with the pulling process from Salesforce. If you would have any additional questions, please contact us. We will be happy to answer them. I have the same issue. If I goto Project metadata components' wizard I can see the new flow I created. It is listed there and checked on. However when I go to pull from salesforce it is not listed. - at the last stage of the pull process, you will see statuses for all the added/updated/deleted files. Please let me know if you don't get new files after the pull from Salesforce is finished. Thanks. However the new flow I created is not listed in the Pull screen so I cannot choose the file to pull. It does show in the Project Metadata Download list. The list of files in the Pull wizard is not the same that you see in the Project Metadata Components wizard. In the Pull wizard, there are only files that are already present in your TWS project, and in the Project Metadata Components wizard you can see all the files from your organization that TWS supports. After you select any file in the Pull wizard, you can proceed to pull from Salesforce and the IDE will download new files (in your case, the new flow) and you will see these files in the results. This is how the pull process is implemented. Please pull any file(s) and check if you would see your flow at the end of the process. Open Project Metadata Components wizard. Click on my new Flows. Click Apply. I then goto the Pull Screen to select and pull down my new flows. However they are not there to select. 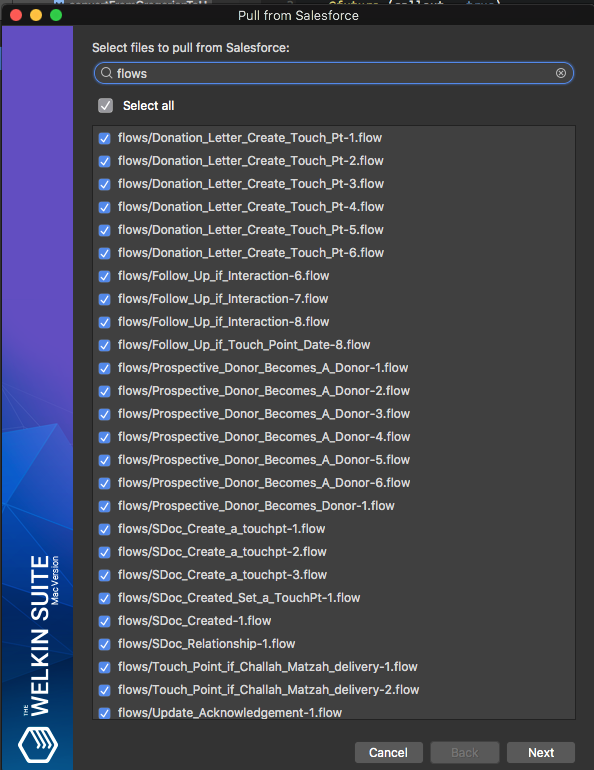 "After you select any file in the Pull wizard, you can proceed to pull from Salesforce and the IDE will download new files"
My flows are not there to select, in the Pull Wizard. Sorry for adding a confusing by this phrase. However, please select any file in the list that you see in the Pull wizard and click 'Next'. After this the pull process will start and the IDE will download your newly created flow to your project. Please let me know if you get your new file after this pulling process. We understand that these steps are not obvious for downloading new files and this could be not clear why to pull any other file for this. However, currently it works this way and we will work on improving this process soon. "please select any file in the list that you see in the Pull wizard and click Next" that is my issue. The flow is not listed for me to select. I have attached 2 screen shots. The first is the listing of flow from the Project metadata components menu screen You can see a list of all my flows, and the flows I circled I circled in Yellow I am trying to download. Thank you for your post and for the screenshots. You can just click 'Next', or please select any other file in the Pull wizard list, for example, the 'Donation_Letter_Create_Touch_Pt-1' and click 'Next'. You will see your HebCalIntegration flow files after this in the next stage of pulling when TWS will download them. Looking forward to your response after these actions. Thanks so much for your work and patience on this. That did work. I know understand how to pull new metadata. I'm happy to hear that you got your new flow files to your TWS project. As I told previously, we are going to improve the pulling process to make it more clear and convenient. If you would have any other questions - please let me know. I'll be happy to answer them and provide you with a necessary information. Hi, I have a similar problem of drivard: when I pull flows, TWS doesn't take all the versions of them: apparently it skips the active one when there are multiple versions. This is known issue to us and here is a link to a related discussion. You can follow the mentioned topic to get updates on it.